Today in the pre-IFA excitement in Berlin, Germany, Lenovo announced updates to their T, X, and S series Ultrabooks, with thinner form factors, a variety of panel options, larger trackpads, and improve battery life. As expected, Intel’s Haswell processors (4th Generation Intel Core Processors) make an appearance, and the new ThinkPad Ultrabooks will be able to offer as much as 17 hours of battery life – with an optional external battery. Here’s a quick overview of the various new products announced today. The T440 and T440s are both 14-inch laptops, but the T440s is slightly lighter and has more compact dimensions and is available with a slightly faster CPU and GPU. The T440s also uses a carbon fiber to keep the weight down without compromising on durability. Both notebooks also feature NFC (Near Field Communication) capability, up to 17 hours of battery life with a high capacity battery, and optional touchscreens. Models with the GeForce GT 720M/730M apparently won’t be available in North America but will be in other regions of the world. The T440s is obviously the more potent and exciting of the two, but cost will be higher. Availability is scheduled for the end of October, with the T440s starting at $1149 and the T440 starting at $889. The X240 is a 12.5-inch laptop designed to be the ultimate road warrior. Like the T440/T440s, it includes NFC capability and optional touchscreens. It loses out on a few extras relative to the 14-inch models but it comes in a more portable and lighter package. 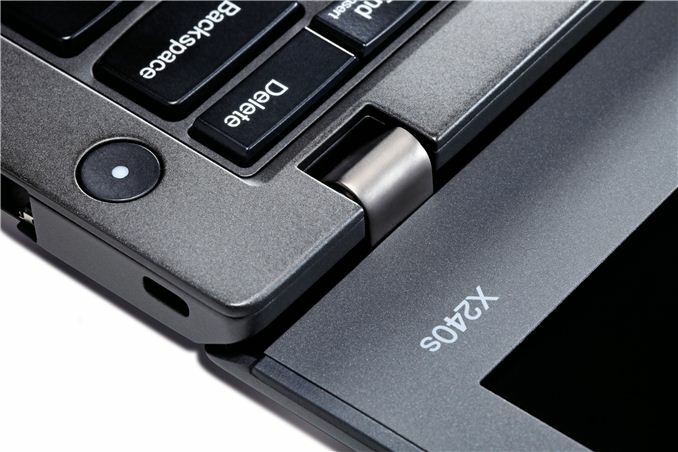 The X240 also features Lenovo’s new Power Bridge functionality, which allows users to swap out the removable battery for the 6-cell travel battery without powering down. (It appears some models will have an optional 3-cell internal battery with the standard “travel battery” being user replaceable/swappable to support this.) Availability is scheduled for the end of October, with the X240 starting at $1099. The S440/S540 will be available in select markets, which does not include North America. The S440 is a 14-inch laptop while the S540 is a 15.6” design; both support up to Core i7 CPUs with optional HD 8670M graphics from AMD (presumably Enduro enabled). The S series is designed for “business or pleasure”, with more multimedia friendly features like voice control, and they support Lenovo’s OneLink technology to allow docking of sorts with USB 3.0, video, power, and Gigabit Ethernet over a single cable. Availability is scheduled for September on the S440 and October for the S540 in Europe, with the S440 starting at €699 and the S540 starting at €649. "I want the ram, the hard drive flexibility and the dock [...] Time for a Macbook"
You didn't mention the most important part of the T440s: the AHVA (IPS-like) matte LCD. Unfortunately it's 16:9 and not 16:10. There's a 23 Wh sealed battery and a swappable 23 Wh battery by default. The latter can be replaced with a thicker one with double the capacity. The biggest flaw for me is that the M.2 slot (which replaces mSATA/mPCIe) only fits 42 mm drives, so it's currently not possible to have a decent-size SSD+HDD. Some models will come with a 24 GB SSD cache. Lenovo got rid of the dedicated mute, volume, page forward, and page back keys. 4 GB RAM is soldered, so max is 12 GB. The way the touchpad clicks (same as T431s) and the poorly designed TrackPoint buttons are likely to put off some buyers. The speakers are on the bottom, but apparently produce good sound if the laptop is on a desk. Not compatible with the OneLink Dock. The Touch models are significantly (~200g) heavier, and MAY have glossy Gorilla Glass. No UltraBay, no ExpressCard slot.